When you’re looking for a new job, chances are you want to work for a company with a brand you love and a mission you believe in. There are millions of companies around the world, but only a few that rise to the top of your list of dream employers. We want to help you expand that list by leveraging LinkedIn’s massive professional dataset. Last year, we introduced the 2012 Most InDemand Employer rankings to identify the 100 most sought after companies on LinkedIn. Today at Talent Connect Las Vegas, we unveiled the 2013 Most InDemand Employer rankings. To determine these rankings, our data scientists analyzed the actions of 238+ million professionals on LinkedIn. In 2013, LinkedIn was home to more than 25 billion interactions between members and companies. At LinkedIn, we love using our data to help members and companies better understand the professional world. 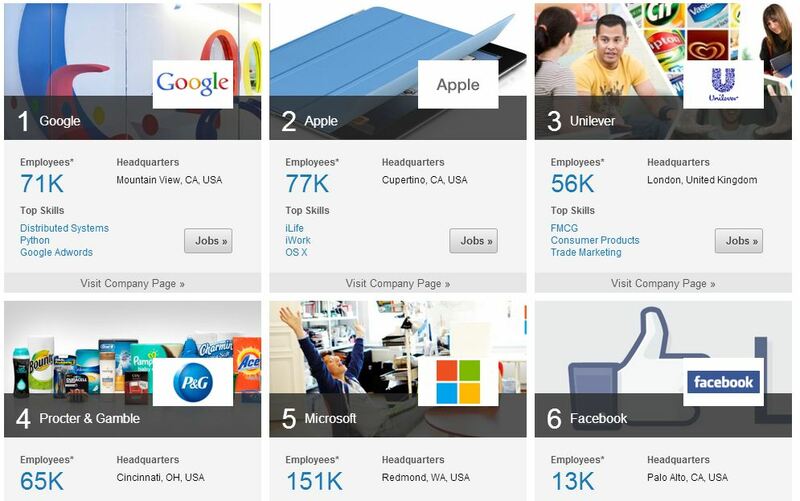 Check out our 2013 Most InDemand Employers rankings to see if there are companies you’ll add to your dream employers list.